On 9 May a major event for all Ministers of Culture and leaders of Europe’s creative industries and memory organisations was held in Brussels. Very positive speeches by Neelie Kroes, Vice-President for the Digital Agenda, and by the Danish Minister on behalf of the current EU Presidency, were followed by statements in support of Europeana by Ministers from a dozen countries. All Ministers had been asked to pick an item from Europeana, and the blogs about their choices can be seen on Europeana’s home page. The full list of choices and the press release are here. The event focused on building support for the Connecting Europe Facility funding infrastructure, one small element of which will support Europeana long-term as a core service. 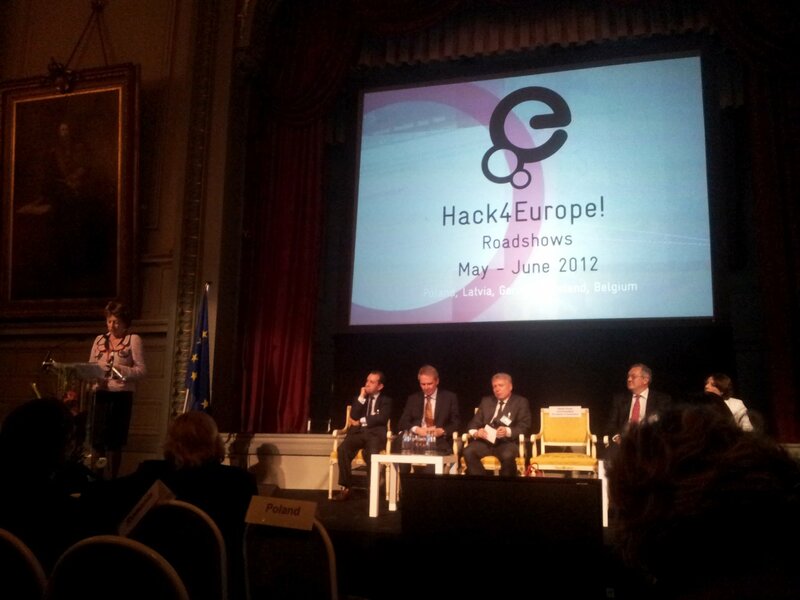 It was also the opportunity for Mme Kroes to launch the Hack4Europe 2012 competition that will take place over the next 6 weeks (click on image below to enlarge). The event began with a seminar that looked at different perspectives on open data, called Culture for Innovation – Recommendations for Change. Advocates of digital innovation and GLAM practitioners developed a set of forceful recommendations that were then taken up by the political representatives in the second part of the programme. Invest in digitization & preservation – only 15% of our cultural heritage is digitised so far! Hack4Europe! is a series of hack days organised by the Europeana Foundation and its partners and provide an exciting environment to explore the potential of open cultural data for social and economic growth in Europe. To feel the atmosphere to the event you can read a short summary of one of the events from the last year edition. This year PSNC is coorganising two hackathons – in Warsaw and Leuven – during May and June 2012. This is part of the activities of Europeana Awareness project. Hack4Europe 2012 Warsaw is being coordinated by National Audiovisual Institute in cooperation with Poznań Supercomputing and Networking Center. The event will take place on 26 and 27 May 2012. Hack4Europe 2012 Leuven is being coordinated by Europeana Foundation in cooperation with Poznań Supercomputing and Networking Center. The event will take place on 13 – 15 June 2012. Two more hackathons will be organised in May and June by other parties. Each of these hackathons will bring together up to 35 developers. They will have access to the diverse and rich Europeana collections containing over 20 million records through the Europeana Search API (incl. a test key and technical documentation). Going mobile: Applications that bring Europeana to the mobile devices be they smartphones or tablets! Take advantage of geo-data and geo-awareness. Mashing-up: Mash-up with other APIs and combine and enrich Europeana content with other free content from e.g. Wikipedia. Social curation: Applications that allow users to curate Europeana content a share it with the world and each others on social platforms. User annotations: Applications that let users enrich Europeana objects with comments, tags, links to external sources, or links to other Europeana objects. This can be in the form of a game. World War One: Special attention will be on applications built to showcase the human interest side of world war one based on the material collected during the Europeana collection days. You can find out more about prototypes developed during previous hackathons on this website. Winners from the individual hackathons will be then further evaluated and one finalist per category will be invited and awarded a special prize during the Digital Agenda Assembly on 21-22 June in Brussels. I had a chance to participate in the first day of Digital Agenda Assembly, the conference organized by European Commision to summarize developments in the area of European digital economony. During two days of conference (16-17 of June) participants had a chance to take a part in series of parallel workshops. Topics covered during the conference were related to seven pillars of Digital Agenda for Europe, including stimulation of growth of single European digital market, interoperability and standards, trust and security, fast and ultra-fast Internet access, research and innovation, enhancing digital literacy, skills and inclusion, ICT-enabled benefits for EU society. During the first day of the conference I was attending „Open data and re-use of public sector information” workshop. Agenda featured multiple case studies coming from several member states, showing that open governmental data can bring benefits to all interested parties, including citizents, administration and commercial entities. Discussions covered things related to financial models behind releasing public data but also boundaries of transparency of public administration (mainly in the context of security). Among other case studies presented during the workshop I wanted to bring your attention to a talk given by Katalin Gallyas showing how Amsterdam authorities are approaching to problems related to open data and its reuse. Katalin was talking about various projects and activities including Open Cities and Open Government Data Initiative. I hope that this short summary will encourage you to take a closer look to slides from her talk. Apart from case studies and discussions, participants had a chance to see the results of Open Data Chalenge and series of hackathons Hack4Europe!.I will come back to Hack4Europe! in my next post. Open Data Challenge was a competition organized by Open Knowledge Foundation in cooperation with multiple institutions all around the Europe. Participants competed in several categories including best application using public open data, best idea for application and best visualization. Organizers received 430 entries from 24 member states, there were 20 000 euros in prizes to win. I encourage you all to watch short video which summarizes the results of the competition. Open Data Challenge from Open Knowledge Foundation on Vimeo. To summarize my impression after the workshop, open data can be really valuable for various commercial entities. This oportunity was already noticed by giant of IT like Google (with its http://opendatakit.org/ and involvement in OpenData Challenge) and Microsoft (Open Government Data Initiative). Hope that involvement of private sector will help to accelerate change in public sector. During the second week of June Europeana foundation have organized a series of four hackthons under the common slogan Hack4Europe! Events were organized by local partners in Poznań, London, Barcelona and Stockholm. Polish hackathon was organized by Poznań Supercomputing and Networking Center and The Kórnik Library of the Polish Academy of Sciences. All hackathons aimed at development of innovative applications created on top of data about 18 million of cultural heritage objects collected by Europeana. Developers competed in four categories: application with greatest commercial potential, application with greatest potential for inclusion, most innovative application and audience award (this one was voted by developers). As a result Hack4Europe! Events gathered 85 developers, who have prepared 48 prototypes. The most common development themes included applications designed for mobile devices, applications using the potential of social networks, solutions allowing users to curate content, integrating Europeana content into various games, connecting cultural heritage data with Wikipedia and finally various visualizations showing how various objects are related. “Art4Europe” was awarded as the application with greatest commercial potential. This project was created by Jakub Jurkiewicz , Marcin Szajek , Jakub Porzuczek and Tomasz Grzywalski who represented ITraff Technology. Zbigniew Tenerowicz and Piotr Kaleta (students from Poznań University Technology) created the most innovative application called “Europeana Field Game”. The winner of greatest social inclusion category was Hackmemory a simple game developed by Bartek Indycki and Darek Walczak. This game also won the audience award. Rest of the prototypes were tools allowing for integration of Europeana API with Google Maps and with MediaWiki. It is also worth to mention that awards for best projects were funded by Speed Up Group sponsors of Poznań Hack4Europe! Authors of the winner in the greatest commercial potential category created application which allows its users to identify given art work using picture taken by the camera of their mobile phone. Art4Europe identifies given object, presents the description of the object, apart from this it can also translate it to any European language and read this description aloud using speech. Users might be also interested in buying reproductions or books about given art work. In “Europeana field game” user can “carry” and pin elements to a location and see elements pinned to a location by other users. The game encourages geotagging by introducing quests to accomplish and interaction with other users. The geotags created by players can be later used to suggest interesting Europeana content for everyone based on location data. The last winner Hackmemory (http://hackmemory.drivent.pl/memory/start) is a simple educational application for kids and adults based on well know memo games. Players have to find two exactly matching pictures. After finding each pair user can read about the content of the picture. User can create his/her own quiz and simply share it with friends on using various social media. The content of the puzzle comes from Europeana and it is filtered by the creator of the quiz (i.e. teacher). Casual Creator (developed during London hackathon) application which facilitates using pictures of the cultural heritage objects in teaching. Time Mash (Stockholm) fully functional geo-location aware search of Europeana for mobile phones. Users can take photos and associate them with existing Europeana objects. Through an inbuilt function to overlay new pictures with Europeana pictures, a seamless “Then-Now” effect is created. The new photos are uploaded with the current GPS position so the app can also function as a geo-tagger tool for Europeana. Timebook (Barcelona) the app integrates content from Europeana and DBpedia and presents it in an easy to use format with, for instance, posts for famous quotes, friends status for influential persons and photos of paintings. Hack4Europe! 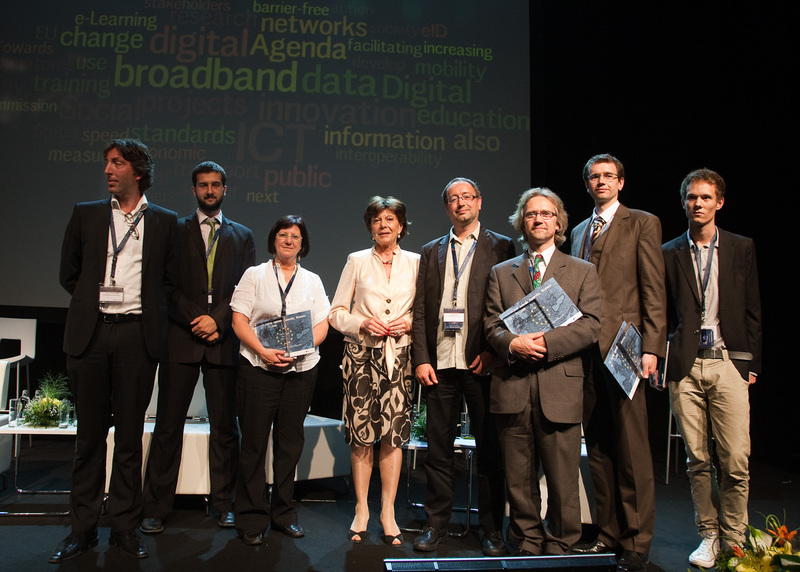 awards ceremony was organized on 16th of June during the Digital Agenda Assembly in Brussels. Winners received prizes from European Commission Vice-President Neelie Kroes.